The man accused of being the Golden State Killer, who terrorized suburban California neighborhoods in a spate of brutal rapes and slayings in the 1970s and '80s before leaving a cold trail that baffled investigators for decades, was arraigned in Sacramento court Friday. Cheryl Hurd reports. The man accused of being the Golden State Killer, who terrorized suburban California neighborhoods in a spate of brutal rapes and slayings in the 1970s and '80s before leaving a cold trail that baffled investigators for decades, was arraigned in Sacramento court Friday. 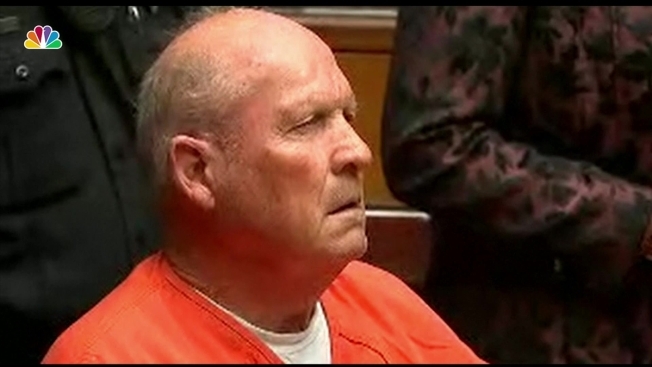 Joseph James DeAngelo, 72, made his first court appearance Friday. Handcuffed to a wheelchair in orange jail scrubs, he looked dazed and spoke in a faint voice to acknowledge he was represented by a public defender. He did not enter a plea. Sacramento County Sheriff Scott Jones has said DeAngelo was in a psychiatric ward of the county jail and has said little. Jones says there's been "quiet reflection" and mumbling. DeAngelo was charged with eight counts of murder in three counties after being linked to the crimes through his DNA. The Sacramento County District Attorney's Office on Thursday confirmed a relative's DNA on genealogy websites helped them track down DeAngelo. Lead investigator Paul Holes told the Mercury News that one of his team's biggest tools was GEDMatch, a Florida-based website that pools DNA profiles that people upload and share publicly. GEDMatch is a free site where users who have DNA profiles from commercial companies such as Ancestry.com and 23andMe, but the free site doesn't require a court order to access the genetic database like the commercial sites do. DeAngelo's six-year career as a cop came swiftly to an end after being busted for shoplifting a can of dog repellant and a hammer from a Pay N' Save store in a Sacramento suburb in 1979. Until a week ago, DeAngelo, who lived in a neatly kept home in the Citrus Heights suburb where many of the attacks went down and where he was caught stealing, was not in their sights.